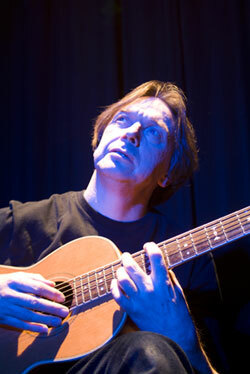 The Lincolnshire based singer, songwriter, Les Brown, has been writing and performing his own songs in folk clubs and at folk and blues festivals, since the mid-eighties and has so far written and recorded ten CD albums as well as also having written, directed and produced a stage musical “Tommies War” in 2004. His last CD, titled “View Point” was well received in folk clubs and at the festivals Les performed at during the 2017 Summer. The CD contains ten songs, all written by Les and features Les playing guitar, ukulele, bouzouki and harmonica. The album was also featured on Radio Lincoln’s weekly folk music programme, where Les discussed the songs with Tom Lane, the presenter and performed two songs live in the studio. Les also was featured on Lincoln University’s Siren Radio where he discussed his Artwork and Music with the shows presenter Alan Ritson and played songs from his previous CD recordings. During the Summer of 2017, Les performed at a number of folk festivals including Whitby, Otley and Lincolnshire Day of Folk. Mainly accompanying himself on guitar, which he plays in a variety of open tunings, Les also plays bouzouki, ukulele, piano, concertina and harmonica and banjo and sings unaccompanied. His latest CD is titled Almanac and has twelve tracks on it. Eleven of the songs are new, but track twelve, “The Healing Time” first appeared on The Love Stone CD, but now has additional lyrics. Guitars Played by Les Brown – Martin D28 and Washburn Parlour guitar R306. The music and lyrics on all of the albums are by Les, but there are other singers and musicians on Winds of Change, The Love Stone, Legacy. About the songs, Les says “I always concentrate on the lyrics first when listening to songs, melody comes second and that’s how I have always approached my own song writing over the years, trying to find the right words to encapsulate my thoughts and feelings about the things I care a lot about. A number of Les’ songs have been performed and recorded by other singers around the British Isles and they have been favourably reviewed in folk magazines as well as local radio stations. Copies of any of the CDs can be purchased by contacting Les directly at gigs or by email. Lyric sheets, guitar tunings, chords for guitar or other instruments for each track can also be supplied.